It takes more than street-style tacos on the menu to deliver Mexican authenticity in restaurants. When I’m looking for the real deal—Mexican cuisine that hasn’t been overly Americanized—my culinary radar tracks certain items: I scan menus for dishes like birria, machaca, mole, posole, menudo and such. Believe it or not, burritos are not a staple of the typical Mexican diet. But, if there are albondigas on the menu, I know I’m in the right place. Well, with the help of adventurous City Weekly readers, I’ve found three excellent Mexican eateries—two that were new to me, and one beloved old standby—that deliver the goods when it comes to down-home, authentic Mexican fare. All of these places are family-run businesses, and all are frequented by a mostly Hispanic clientele—always a good sign. And, although English is barely spoken, they are each super-friendly and easy enough to navigate with little or no Spanish. The menus feature photos of the dishes served so, if necessary, you could simply point to order. Meals at all three of these restaurants begin with free servings of housemade chips and salsa. At El Maguey (715 S. 900 West, 801-359-3365), two salsas are offered: a spicy, deep-red salsa tasting of chiles de árbol and an unusual but delicious avocado-cilantro salsa the color of pistachio ice cream. I was tipped off to El Maguey by international man of mystery and longtime City Weekly supporter and contributor Mick Huerta. When Huerta speaks of food, I listen. His praises for this warm, comforting eatery were spot-on; you won’t find a nicer or more accommodating staff anywhere. I can’t resist the gorditas at El Maguey. A gordita (“little fat one”) is a corn cake made from masa harina, stuffed with any of the ingredients that tacos come with, ranging from carnitas, cabeza, lengua and chicharrón to shredded beef, chicken, chorizo, refried beans and cheese. They’re only $1.29 each, so order of mess of ’em and find your favorite. Tacos, which come with a side dish of chopped white onion, fresh cilantro and lime wedges, are a mere $1.25 apiece. There’s also a large seafood selection at El Maguey that includes ceviche, oysters on the half-shell, shrimp cocktail and my favorite: camarones al mojo de ajo ($10.99), which is a generous portion of shrimp sautéed in a subtle garlic sauce and served with frijoles, Mexican rice, salad and fresh tortillas. 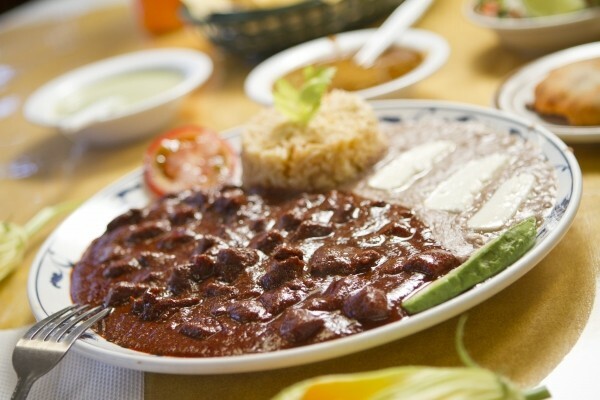 A scrumptious house specialty is asado Zacatecano ($9.29), which is tender pieces of cubed beef in a fiery red chile sauce made from guajillo chiles, with hints of bay leaf—somewhat similar to this country’s chile Colorado. And I highly recommend stopping in on a Sunday—maybe on the way to the People’s Market just up the street—for a big bowl of posole. Both red and green versions are offered ($4.99), and I love the rich, deep flavors of the posole rojo, teaming with hominy and tender chunks of pork. A longtime foodie informant named Glen Lamson tipped me off to Midvale’s El Mana (7962 S. State, 801-563-5196) restaurant (formerly El Taconazo), another charming, family-run restaurant that oozes good vibes and delectable flavors. The same friendly lady has served me each visit, and her English is excellent—much better than my Spanish, for sure. The sopes ($3) are terrific: thick masa patties topped with a choice of beef, chicken or pork, along with onions, lettuce, sour cream and cotija cheese. The fish tacos ($1.50 each) are also exceptional, made with mahi mahi that is sauteed, not breaded and deep-fried as is the case at many places. A chile verde burrito was teaming with big chunks of tender, braised pork, and kids love the cheese and shredded-chicken quesadillas ($5.99). Be sure, however, to take a look at the daily specials, which are written on a chalkboard near the front door. Otherwise, you might miss some of the more interesting El Mana fare, like birria. Birria en caldo ($7.99 regular/$8.99 large) is shredded, roasted goat in a delicious housemade broth, a traditional dish of Jalisco. There’s also birria de res—shredded goat meat in a rich red chile sauce. And on weekends, El Mana offers menudo (tripe soup) and a unique combination of lamb soup with two lamb tacos for $8.99. For kids who might not be ready to try goat or lamb, there’s a childrens menu with familiar foods like cheeseburgers, chicken tenders and french fries. And finally, my longtime favorite mom & pop Mexican joint: Julia’s (51 S. 1000 West, 801-521-4228). I’ve written about Julia’s in the past, so I won’t belabor the point here, other than to remind you what a little gem this place is. It’s usually crowded—which says something about the food, since there’s no atmosphere to speak of. In fact, ambiance isn’t the strong suit of any of this trio of restaurants. But I return to Julia’s for the friendly service (which seems especially eager to accommodate gringos) and housemade dishes like shredded beef with eggs (machaca con huevos), the tongue-blistering camarones a la Diabla ($11.25)—shrimp in a fiery chile sauce—whole fried tilapia (mojarra), and hearty soups and stews like caldo de pollo ($8.50) and birria de chivo ($9.75). The tortas ($5.25) at Julia’s are really tasty, too: traditional Mexican sandwiches loaded with shredded lettuce, sliced avocado and tomato on a soft bolillo. The shredded-chicken version is especially good. And, if you ever encounter refried beans that are creamier and more mouth-watering than Julia’s, please let me know. If beans can be called “heavenly,” these certainly are.